Me too, man I got worn out! I need to save up my energy all year if I'm going in 2010! Cool shot! Glad to hear you went to BlogHer. I'm planning on going in 2010 if I can get a sponsor. Dang, never did get a chance to hit any of the museums in Chicago. Great pic! Mirror mazes are so fun! It sounds like you had a great time at Blogher!! I have days like those when I wish there were more of me; yesterday was one of them. We'll have to visit that museum the next time we're in Chicago. I'm sure my children would love it. We only made it to the Children's Museum the last time we were there. That's really cool! Happy WW! My kids would have love this mirror maze! What a neat shot. I'm glad you enjoyed the blogher conference. I would have loved to gone. I enjoyed reading your recaps. It sounds like so much fun. Maybe I'll go next year. That's really neat! Looks like fun! Very neat photo! I hope you had a blast at BlogHer! Great pic! I love that effect where you can look in the mirror and see the image repeated on and on and on... FUN! That's such a cool shot! 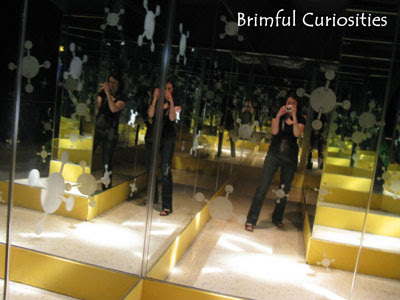 Way cool picture - those mirror mazes really freak me out! !